Sun protection for sensitive skin with a formula rich in organic oils with antioxidant, nourishing and regenerating properties. 99% natural origin, mineral sunscreen, liquid texture, non-toxic to the marine environment. 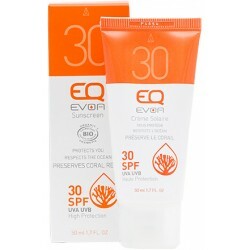 Reapply throughout the day to maintain sun protection. Aqua (water), Dicaprylyl carbonate, Zinc oxide, Titanium dioxide, Caprylic/Capric triglyceride, Glycerin*, Cocoglycerides, Polyglyceryl-3 diisostearate, Butyrospermum parkii butter* (shea), Calophyllum inophyllum seed oil* (tamanu), Helianthus annuus hybrid oil* (sunflower), Parfum, Polyglyceryl-2 dipolyhydroxystearate, Aluminium hydroxide, Stearic acid, Cera alba (beeswax), Polyhydroxystearic acid, Sodium chloride, Zina stearate, Benzyl alcohol, Tocopherol, Dehydroacetic acid. Due to the inclusion of beeswax, this sunscreen is not suitable for vegans.